The Abell 2142 galaxy cluster is at the center of a supercluster that is one of the most massive objects in the universe as it’s made up of hundreds of galaxies already formed together with an amount of gas that’s enough to form many more. It extends over six million light years and is continuing to grow attracting other galaxies within the supercluster. The observations of that supercluster have been going on for some time, also to try to understand the dynamics within it with more or less large groups of galaxies that influence each other, attract each other and sometimes merge. 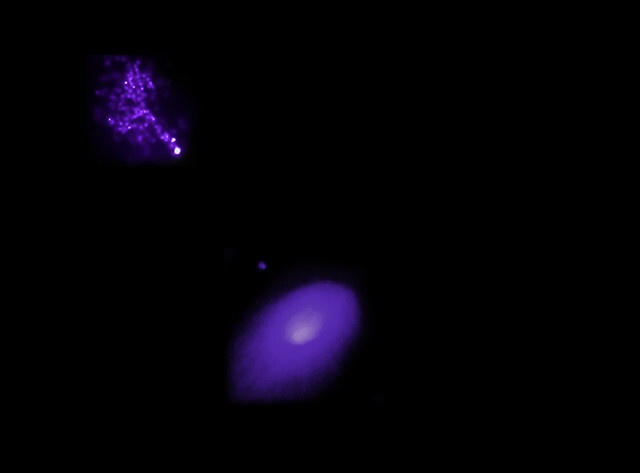 This is happening to some galaxies attracted by the Abell 2142 cluster as shown in the top image (NASA/CXC/Univ. Of Geneva, D. Eckert Optical: SDSS provided by CDS through Aladin), where the cluster is the disk-shaped structure at the bottom and the attracted group is the irregularly shaped structure at the top. 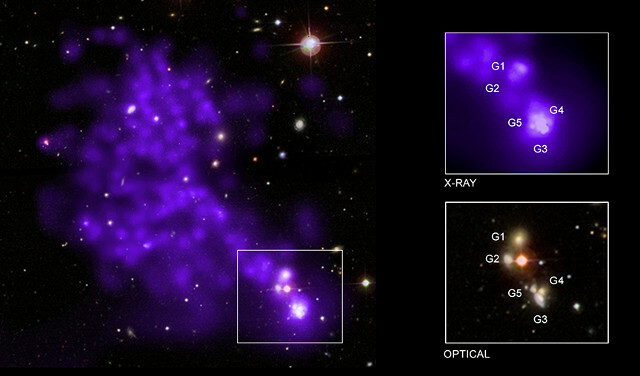 The galaxies that are approaching Abell 2142 are shown in the bottom image (NASA/CXC/Univ. Of Geneva, D. Eckert Optical: SDSS provided by CDS through Aladin) with an X-ray magnification in the upper inset and at visible frequencies in the lower one showing the galaxies G1, G3, 64 and G5 together with the galaxy G2, which is in the background and not part of the group. The four galaxies form the brightest part of a kind of tail coming out of a larger group while a part of its gas is stripped due to gravitational effects. The Chandra observatory’s detections show that in the tail the gas can reach temperatures of millions of degrees. Its shape suggests the possibility of the presence of magnetic fields around it that act as a shield that contains the gas. The lower part of the tail is brighter and this could be due to a previous asymmetry in the gas of the group of galaxies attracted by Abell 2142. This could be caused by a supermassive black hole in the center of one of the galaxies in the attracted group or by mergers between galaxies in the group. The data confirm the presence of supermassive black holes at the center of the G3 and G4 galaxies. The study of these events is very useful to understand the evolution of galaxy clusters and even superclusters because it shows the first steps of a group of galaxies approaching a cluster. Such events are very difficult to observe but the consequences are very important in particular for the galaxies of the group attracted by Abell 2142 and for this reason this case will keep on being studied.